This page refers to the Batch Overview, found by viewing a batch from the Batches page in the Settings > Make area.. For information on creating, editing and listing Batches, view the Batches help page. If you look on the detail page of any Batch, you will be presented with a summary of what Vinsight knows about it. There are three sections, Current Vessels, Winery Operations, and Lab Analyses. Each one will tell you all the information we have on record for that Batch. The Vessels section of a Batch, will show you all the vessels that the Batch is currently in. The view is paged, so if you have more than 20 vessels, you can press the next/previous links above the vessels to see the rest. The colours represent the status of the wine in each vessels as determined by the Wine Statuses area. 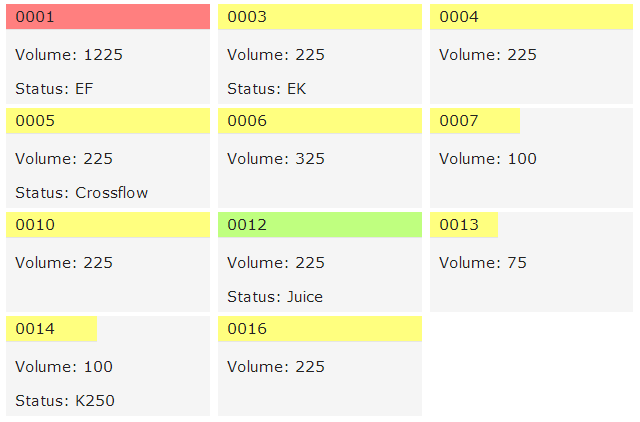 If the wine in a vessel has no status, the default colour is yellow. If you want to view any of the vessels in detail, simply click on the vessel’s name and you will be taken to the corresponding vessel’s page. The length of the coloured bars represent the percentage of wine this vessel currently has in respect to it’s capacity. So if your vessel is 50% full, you will see the bar only reach 50% of the header. The top row (next to the button) is an aggregation of all the analyses in current vessels for this batch. 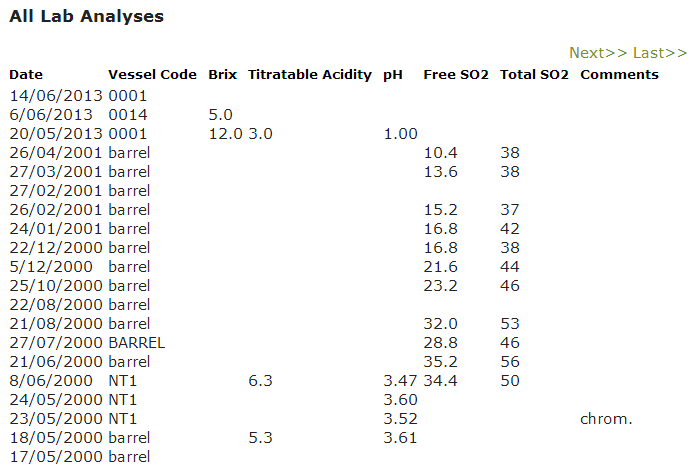 If you do not have values recorded for all the vessels listed, the summary will display “n/a”. However you can tell it to ignore incomplete values by changing the switch above from No to Yes. This will be less accurate but it can help you to get an overall feel of the state of the Wine Batch. Toggling the “Show Empty Columns” switch will show or hide any empty columns so you don’t have any unnecessary information showing. Changing the analysis set will change what columns are displayed based on the Analysis Set’s settings.